The Roosevelt Elementary Education Foundation brings high-caliber cultural arts experiences to campus throughout the year. Assemblies cover a variety of genres and are inspirational, celebratory, informative and just plain fun! 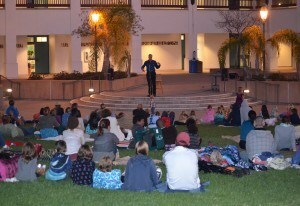 Roosevelt Family Nights are free REEF sponsored events run semi-monthly. From Mission Rose Garden picnics to live performances, these fun-filled evenings are designed to celebrate community and family. There’s nothing to buy – just show up and enjoy! Faustworks Mask Theatre performed for grades 1-6 in December. This one-man show celebrated the history and many uses of masks and highlighted our use of body language and “figurative masks” (work clothes, make up, etc.) in our everyday lives. What’s more, it was very, very funny. Ask your child about this assembly! 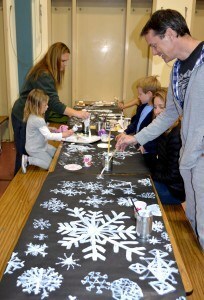 The December Family Art Night, Let It Snow, brought out the artist in all who attended! Large pieces of black butcher paper paired with a variety of white art materials were transformed into winter landscapes, cotton ball snowmen, blizzards and more. These whimsical creations decked the downstairs hallways of Roosevelt bringing seldom seen snow to another fabulous Santa Barbara winter!